You likely well know this, but we love books at our house. And no trip is complete without them! I have fond memories of my mom reading to us on long car trips and I hope to create those same memories for my children. These are great for reading aloud or letting the children read/look at themselves. I tried to pick books that corresponded with some of the places we were visiting and things we were doing to make them a little more relevant. 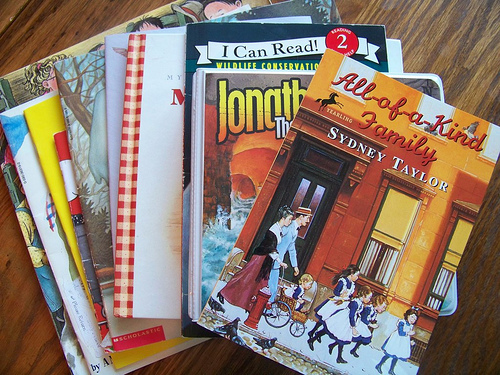 You can find our family’s 15 favorite read-alouds here if you need ideas for good books. We get most of our books from PaperBackSwap since, sadly, our library system here is nothing like the wonderful library system we had in Topeka and Kansas City (we were spoiled there — no late fees, very clean and modern facilities and lots of new books and new releases!). I always try to bring one chapter book along to read in the car and at night as we’re snuggled up in bed before going to sleep. The children beg for me to read every night and there’s nothing that beats a good chapter book while we’re all snuggled under the covers together! One of the ways we pass a lot of time in the car is by listening to great audio. One of our children’s current favorites is the We also enjoy the and the The girls also recently listened to during their afternoon quiet time and were enthralled with it. Don’t forget to bring some books for yourself, too. Road trips almost always provide some time to enjoy longer stretches of reading than you might usually be able to enjoy at home. I brought , , and . 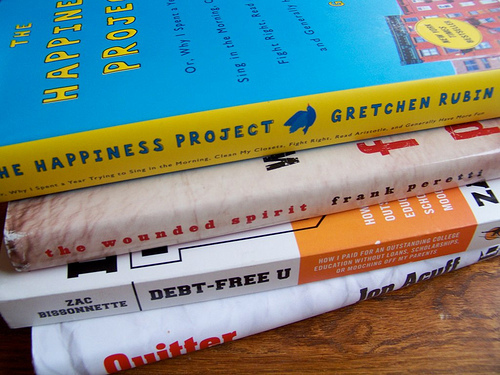 Reviews on these books will be posted in a few weeks when I share about the books I’ve read this month. We LOVE listening to audio in the car. We drive at least 40 miles round trip several times a week and besides our favorite podcasts we have lately been listening to the Narnia series done by Focus on the Family radio theater. We’ve also listened to Stuart Little and Mouse and the Motorcycle in the past few months. One of my favourite series as a kid was the All of a Kind Family. I recently took them out of the library to reread — and I still love them. For when the girls are older — they would likely also like the Booky series by Bernice Thurman Hunter (the Margaret series is also good). She is a Cdn author but I think your girls would still like them (the Booky series takes place in Toronto during the depression and Margaret during the Polio epidemic). We traveled the 500 miles to visit Grandma 5 to 6 times a year when my kids we little. We loved classic children’s literature on audio – Old Yeller, Where the Red Fern Grows + a few just for silly fun – Hank the Cow Dog series. I kept Tupperware containers that fit under the seat filled with markers, coloring books and activity books, too. They used the box as a lap desk. We too a trip from Texas to Disneyworld in Florida when our kids were 6 and 10. They loved Hank the Cowdog on the way! My husband is the librarian in Meade, KS. While your library system may not be the incredible experience you are used to (I know, we lived in Topeka before moving here – it was an amazing library! ), don’t discount using the services at the library. You can still get just about any book for almost free through inter-library loan. If your particular library is not a comfortable place for you, consider going to a smaller library in a nearby community. Also, you may already be familiar with this, but the State Library offers a free State Library card that offers you access to lots of free audiobooks and other resources. Oh Crystal, I had to comment because I love All of Kind Family! Your girls also might enjoy the Betsy Tacy Books; I’m planning to start the first with my 4-1/2 year old soon. I was going to suggest the Betsy-Tacy books too! I loved those when I was a little girl! We have a family wide-spread car sickness epidemic which unfortunately prevents any books, coloring, etc. 😉 However, we LOVE the Johnathan Park series, we burn lectures/sermons onto cds before we go too. Finally, we also have catechism on cd as well as bible verses to song on cd that allow for some time of the kids “singing and learning” at the same time. This variety solves our problem with car sickness, but allows for each of us to be edified and entertained! We tell the kids “one Jonathan Park, then one lecture/sermon and discussion and then some singing time” and just keep rotating through this cycle depending on how long the road trip is! I love The Wounded Spirit-and anything by Frank Perretti. I hope you enjoy it, too! Before a big trip, consider going to yard sales the weekend before to pick up some new books for your kids. I often even find kid audio books, too. Often books at yard sales are only $0.25 each, and I always pack little bags of never before seen books for my kids. They read/look through them all, then switch bags. Hours of entertainment! Awhh poor kiddos! Ever since I was a little girl, I’ve been the same way. To this day, I still can’t read in the car, but my husband can so maybe the kids will be able to also. Time will tell. I also hadn’t considered audio books which I think is a great idea. I get carsick if I read in the car too – so there would be no way I could read to the kids on a roaptrip! But the audio books are a great idea! We also love radio channel surfing. I don’t know why, but we find it so amusing to put the radio on “scan/seek” and see what it find in the area! Hi there! Just a quick tip for road trips and days when your running errands with the kids…. PATCH THE PIRATE CD’S!! They are sold by Majesty Music. They are fantastic, character building stories for children but honestly adults love them too. My kids love them and beg to listen to them everytime we get in the car. We purchase a new one everytime we plan some kind of trip. Some all time favorites are Custard’s last stand (about family togetherness), The lone stranger (about being strong in the Lord). Have a great summer!! Sorry to hear about your library not having the best resources. The company I work for, has thousands of books as well as audiobooks on cassette and CD, (CDs and DVDs too, if you have portable or in-car players) that would be great for road trips. We pay cash for used media items and then resell them to keep them out of landfills. And you can repeat the process so when you get back from a road trip you can then trade those books back in to us for cash or for new books and audio books for the next trip. Almost every long trip for us is precluded by a trip to the library to borrow a pile of books on tape/CD. Our library is small, but luckily has a good-sized collection from which to choose. Books for the car ride are only good if you don’t get carsick! 🙁 But audio is great. Highly recommend Patch the Pirate! Kids love it! The All-Of-A Kind Family series was my favorite and my daughter has loved the books as well. Your children might also enjoy the Bobbsey Twins series. They were popular in the 1950’s and I found the entire series in our library. Jonathan Park is our family favorite!!! We almost can’t wait to take a road trip just to listen to those! =) Great ideas! When I was a kid, the best part of taking a road trip was going to the bookstore before the trip. My mom would let us pick out 6 books each (no idea why that particular number), and she’d buy them for us. But then, we weren’t allowed to touch them until the trip. Oh, the anticipation! I hope to do the same for my son someday. We miss the Topeka library too. You can’t beat no late fees and checking out books online and having them mailed to you for free! When we moved we had no idea how spoiled we were! We bought our kids the Adventures in Odyssey “A Maze of Mysteries” set for Christmas, and any time we are in the car they yell out “Odyssey please!” They love the stories and we have gone through the 8-disc set (9 hours worth) many times already. I think we’re going to have to get some new Odyssey stories for our long road trips coming up this summer! I agree with Magna-Doodles. That and books are what we keep in the car and it keeps my two little ones entertained! Have you tried books and magnadoodles? My kids first road trips were when they were a month old so I have them both trained. We could never make the drive from Kansas to Massachusetts without Jonathan Parks & Patch the Pirate cds! My boys and I all get car sick if we read AT ALL, so audios are a real life saver for us! We always used to get a new Adventures in Odyssey set when going on a trip. I still like to listen to them in the car and now I’m 25! lol. I know have all the old collection. Too bad they are on tape and I only have a CD player in the car. My husband is going to help me start converting my old cassette Adventures in Odyssey to MP3, then you can burn them to a CD and fit a lot more on, or play them from your MP3 device if your player has a jack for it. At 28, I also still listen to Odyssey, though I have finally cut myself off from purchasing the recent revamp. After volume 50 I swear I’m done. I also love All of a Kind Family. A teacher read it to me aloud in the second or third grade and I’ve been reading the whole series ever since. (I reread them every few years). We survived childhood road trips via books and Adventures in Odyssey. By the time we were in high school we owned all the current adventures (30 some volumes) and I’ve recently started collecting them again. (My husband thinks I’m a big dork, but I like listening to them while I do housework and my two year old already knows the names of main characters. I can’t wait until my daughter is old enough to enjoy these as well. I was so glad to see an article that didn’t recommend a DVD player as the first and only line of defense for road trips. Granted, my sister and I would have given our right arms for one when we were kids, but I think that it was better that we didn’t. If you love All of a Kind Family, you will ADORE Understood Betsy!!!! Get it and read it to your girlies! They (and your husband) will love it! Audio books are awesome – worked like a charm when my boys were little. “The Great Railway Adventures” series by Lionel were a favorite!!!!! Classic stories at their best. My hubby and I enjoyed listening to them as much as the boys! not sure how to listen to the CD books in the car. we have tried several times and the road/car noise is too loud, we cant hear a thing. Its a new car. I agree with Sona. Our Camry makes it impossible to hear the CD books well. Is it the road noise in So Cal or just my car’s system? Oh…and I’m looking forward to hearing your review of Quitter. I plan to purchase that for my husband’s birthday as it sounds like the perfect read for him right now. I saw you linked the books to amazon. Don’t forget library books will loan books, most of the time for 3 weeks or more, which should give you enough time to take them on vacation and return them before they are overdue. Oh! Oh! Oh! I LOVE All-of-a-Kind Family! I have that on my read-alouds list for my sons, along with all the Little House books and Charlotte’s Web. Among others, we’ve read Stuart Little and all the Narnia Chronicles and are actually starting on The Hobbit. It’s been harder to get my older son interested in All-of-a-Kind Family and the Little House books than in the “fighting” books. I hope his interests broaden eventually. 🙂 Love your favorite books lists. If I read anything in a moving vehicle its awful I get sick just thinking about it, our van with the tv has been a life saver! Not sure if my kids get car sick yet, they don’t seem to and we do have a 3 1/2 hour drive vacay coming up so we may have to check out some books on audio from the library! Oooh, love the idea of reading chapter books on vacation! You’re creating great memories! My kids LOVE the Jonathan Park series! I think we’re on volume four. I’m sure by the time we’re done homeschooling we’ll have the entire collection and CDs will be a thing of the past. 🙂 Do you find any good deals on those or do you think of it as an investment? We’re currently listening to the Focus on the Family Radio Theater of Naria. It was $20.00 through Christian Book Distributors! For the entire set! AND I got an activity book and a large discussion guide book to correspond with the Narnia series and spent less than $7.00! That’s a great site sometimes! Adventures In Odyssey is great! They’re extremely funny too. Everyone in the family loves them. We like to find a new CD pack (usually comes with 4 CDs with 3 episodes on each CD) before the trip and listen the whole time during our trip. We love getting audiobooks from the library! Nothing else keeps my kids so quiet and well-behaved. Our family has enjoyed Magic Treehouse, Flat Stanley, Sarah Plain and Tall (one I remember from my own childhood car trips!) and we are currently enjoying the Harry Potter series . I’ve never heard of the OneofaKindFamily series. Can anyone tell me what grade level this is at? My 10 year old daughter is not too interested in reading the Little House series for some reason. Thanks too for reminding me about the Bobsy Twins too. I never travel anywhere without a deck of Uno cards. They’re great for all ages: toddlers will enjoy examining, eating and bending each card and then dropping them off the side of the car seat. And when you collect them all and give them back it’s like a new toy! (Obviously this deck is only for the toddler.) Older kids can use a deck for color and number id/matching. The deck also works for go fish, snap, old maid, concentration and, of course, Uno. Robert Munsch is a great children’s author and has a website where you can download recordings of his stories for personal use. I also like to bring something that involves working the hands, like a small bead rollercoaster for little kids and some sort of big piece construction toy for older kids. Magnetic dolls or travel games are also great. And I have a travel-sized lite brite as well. We travel often enough that I keep a box of travel toys and add to it as I find things. The travel toys can only come out when we’re traveling, otherwise they’ll get stale. Our local library in Kentucky had these great themed backpacks you could check out. There would be a couple books and a few skills toys around a theme like feelings, dinosaurs, colors, etc. I loved All of a Kind Family as a kid. That’s how I learned about half sour pickles, soda crackers and Yom Kippur and Purim! I love the All of a Kind Family! As others have recommended, Betsy-Tacy is another good series. I also loved The Five Little Peppers and the Mrs. Piggle-Wiggle books. And the Shoe books by Noel Streatfeild – Ballet Shoes, Theater Shoes, Dancing Shoes, etc. We just took a 5 hour road trip over Memorial Day weekend with a 15-mo old and two big dogs and we are still exhausted from it!! The dogs traveled perfectly, the the busy toddler was pretty tired of being stuck in a hot car by the time we drove home. We tried to keep the same eating/snack schedule, but the nap schedule was completely off. And we learned that we cannot share the same hotel room when baby’s bed time is 7:30! Next time we get adjoining rooms so we don’t have to hide in the bathroom with our laptops until the baby falls asleep! I envy you – I get carsick if I do anything but stare straight forward. I sometimes can get away with looking out the side window or getting a snack. Audiobooks are a good idea though. Usually we turn on music or talk (no kiddos for us yet). I sometimes have a hard time concentrating on audiobooks but they might be useful in those long stretches. У нашей фирмы авторитетный портал , он описывает в статьях про нарядные платья для девочки запорожье.